Republican Sens. 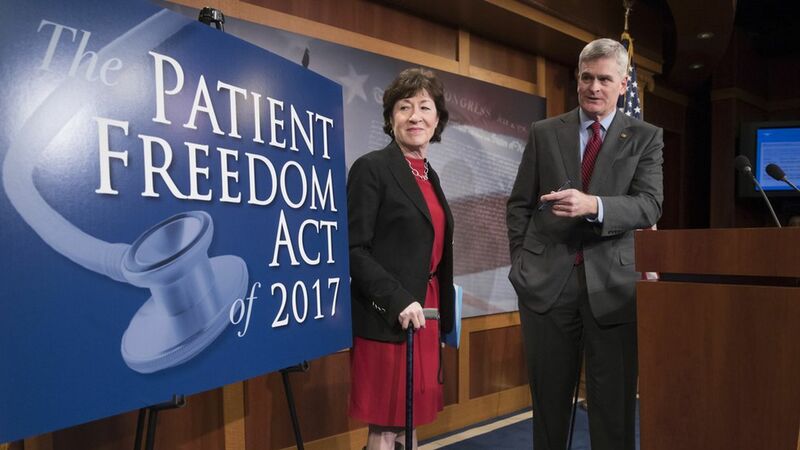 Bill Cassidy and Susan Collins introduced an Obamacare replacement bill on Monday that allows states to keep Obamacare if they want to. Both have been vocal about the need to repeal and replace the law at the same time. While Republicans have no shortage of replacement ideas, this one could actually have legs. The bill is much more moderate than other proposals, allowing some pieces of Obamacare to stay in place. A senior GOP aide on the bill: "Important voices ... Not all terrible ideas. Could be interesting." But Senate Minority Leader Chuck Schumer is already shooting it down: "Ultimately, this proposal is an empty facade that would create chaos — not care — for millions of Americans," he said in a statement. It lets states decide whether to keep Obamacare or get rid of it, a contrast to calls for total repeal. The "default option" would allow states to auto-enroll the uninsured into a high-deductible plan, financed by a health savings account that the state would fund. Individuals could opt out. States would get a per-capita allotment of money from the federal government based on the number of people on exchanges and Medicaid. The amount of money going to states would be the same as they receive now, plus they'd still get extra money if they decide to expand Medicaid. Keeps Obamacare consumer protection provisions such as the requirement to cover pre-existing conditions, the prohibition on annual and lifetime spending caps, and the option for children to stay on their parents' plan up to age 26. Collins suggested that by introducing the bill, she's hoping to get the replacement conversation moving. "If we do not start putting specific legislation on the table that can be debated, refined, amended and enacted, then we will fail the American people," she said.